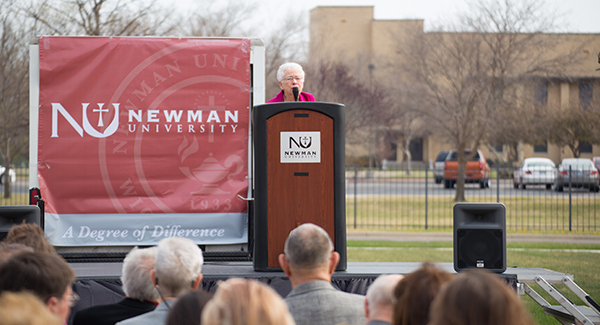 On a windy Friday afternoon, Heimerman Plaza, the Bishop Emeritus Eugene J. Gerber sculpture and Gerber Family Commons were dedicated on the Newman University campus. On April 20, Vice President for University Advancement J.V. Johnston greeted the audience that had gathered to celebrate the newest additions to campus. The ceremony took place slightly west of the Bishop Gerber Science Center, where the Heimerman Science Building once stood. Speeches were given by President Noreen M. Carrocci, Ph. D., former President Sister Tarcisia Roths, Ph.D., and Linda Davison, former Board of Trustees chair and Gerber’s niece. The prayer and blessing were delivered by Father Mike Simone, a chancellor of the Catholic Diocese of Wichita and director of the new St. Joseph House of Formation. Carrocci began by thanking all in attendance for their support throughout the Facing Forward Campaign. She then explained the importance of the Heimerman Plaza, the sculpture and the Gerber Family Commons. The answer is no. The footprint of the Heimerman Science Building is visible through the circular sidewalk that outlines where the building’s walls once stood. Along that sidewalk are commemorative benches, a memorial wall and an area for relaxation, reflection or outdoor classes. 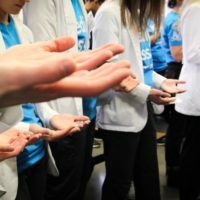 “The benches around the circle honor key faculty from the 50 years of Heimerman Science Center who played an important role in educating our students in science, math and health sciences, and elevated our programs to the elite levels we enjoy today,” said Carrocci. Some honorees present at the ceremony included Sister Margaret Knoeber, Joan Felts, Ph.D., Surrendra Singh, Ph.D., and Sister JoAnn Mark. “The Honor Wall recognizes Sister Heimerman, (former) Presidents Sister Sylvia Gorges and Sister Roths, and three Adorers (of Christ) who pioneered in teaching biology and chemistry from the days of our founding in 1933 to the mid-’70s,” Carrocci added. The Gerber sculpture was created by artist Lori Norwood, who is based out of Lawrence, Kansas. Norwood gave a short presentation prior to the dedication ceremonies about the process of creating the 400-pound bronze sculpture. 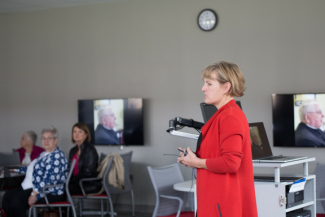 Artist Lori Norwood showing photos she used for inspiration during her creation of the Bishop Emeritus Eugene J. Gerber sculpture. Norwood said she did her best to capture the true essence of Gerber, and most agreed she absolutely succeeded. The sculpture greets all who enter through the front doors of the Bishop Gerber Science Center with a wide smile and open arms. Just behind the sculpture is the Gerber Family Commons, a patio with welcoming tables and chairs for those on campus to spend their free time. The new space was named for the Gerber family, who were very generous in supporting the Facing Forward campaign and the new science center.